10215 Cape Roman Rd #101, Estero, FL.| MLS# 219006585 | Southwest Florida Residential Real Estate for Sale. This attached Portobello III courtyard villa is in excellent condition with many upgrades and is located on the cud-de-sac. UPGRADES include large tile throughout living areas, granite kitchen counter tops along with custom backsplash and Newer stainless steel Dishwasher, Refrigerator, Range, & Microwave. The master bathroom has been completely remodeled with new flooring, custom cabinets and counter tops, shower and stand along bath tub. 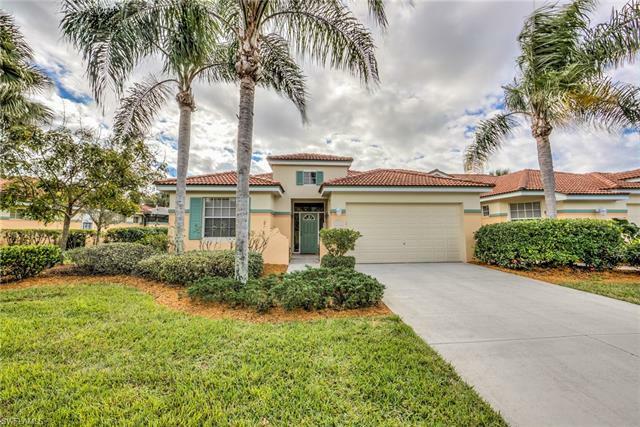 Enjoy the pool and spa on the large lanai with lake and preserve views. Offered Partially Furnished. Lighthouse Bay offers 5 Pools including a lap pool in Swimming Atrium, Lagoon Pool is 2500 square foot with rock waterfall and spa, plus 3 cabana pools, 6 lighted HydroCourt tennis courts, Bocce Court, Health Club with cardio exercise area, Massage room, Boathouse with lighthouse, paddle boats, canoes and fishing boats. Freshwater Sunning Beach, 3 Miles of Walking Paths, and 10 acres of Old Florida nature park.